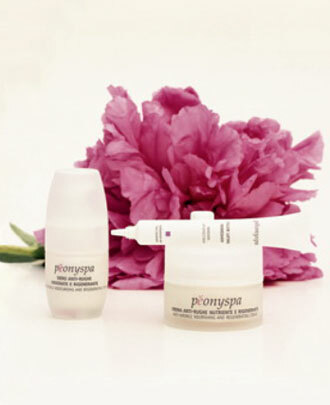 All Pèonyspa products are the result of advanced research and groundbreaking formulation, in which the phytoextracts of either paeonia suffruticosa or paeonia lactiflora are combined with the finest vegetable-derived substances, creating a specific response to every type of skin. Special, innovative formulas contain microcapsules that gradually release a constant stream of the principal active ingredients, guaranteeing prolonged benefits without aggravating even the most delicate skin. As with all the best and latest cosmetic products, the strength, effectiveness, and quality of the Pèonyspa products are due to the use of vegetable extracts equivalent to substances naturally present in the skin, including: phytaluronate (extract of ceratonia siliqua), a vegetable equivalent to hyaluronic acid; malva sylvestris (mallow) phytoestrogens, ideal to strengthen aging tissues (ages 50-plus); and trehalose, a sugar with the highest hydrating power and capacity to maintain the integrity of cellular membranes even in the most stressful conditions.